Bill West and Chad Mailloux, both of Accuristix, Separately Send in Winning Entries in Office Caption Contest Duel! We couldn't help it - these two were in an office competition, and both sent in really good entries! (Bentonville is home to Walmart, BTW. This was again a very hard contest - dozens of great ones, some 125 submissions in total! See other great captions below. It's a long list - we had many really good ones. New cartoon on the SCDigest web site on Monday, March 29, 2010. "And that will conclude my supply chain software for big box retailers demonstration. Any questions?" 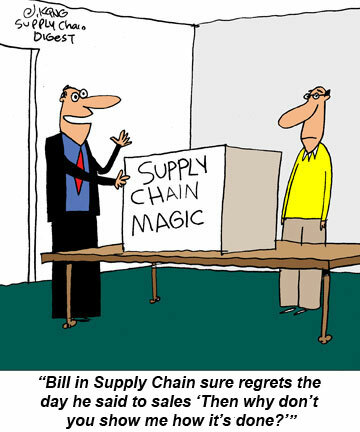 “Your proposal sounds intriguing, but we're going with "Supply Chain Silver Bullet” instead." "Just in from Hogwarts Industries Inc...now...where do you guys keep your brooms?" "Do we install this before or after the Marketing Forecast Madness module?" "Great! No more forecast error, low fill rates...by the way, who is Pandora Software?" "This is the prototype. It has some kinks, but everybody is talking about it!" 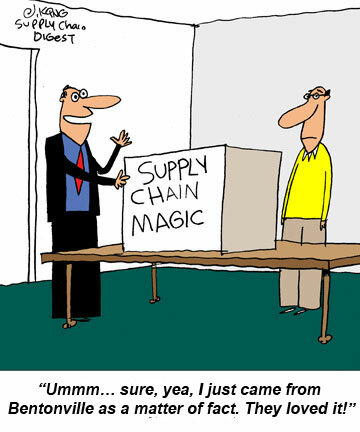 "For my next trick, I will make your inbound freight costs disappear." "Hey Dave, look what I bought! Do you mind putting this together for me?" "And to think it was right here in this box all along!"